Access the Company's Uniform Collection here. Follow the Company on Twitter as CMHist. The Company has a collection of approximately 300 nineteenth century uniform items purchased by Mrs. Anne S. K. Brown in the early 1950s. The purchases were from two major private collections and the materials have the importance of having a known provenance for over a half century. A number of items include records of either manufacture or use and the collection is a treasure trove for both the scholar and the novice. 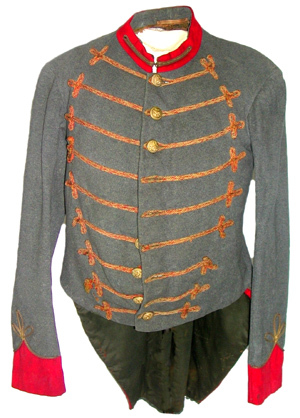 The collection has uniforms as early as 1810 with the majority relating to 1850s militia and to variations of Civil War uniforms, both Union and Confederate. An online index for the collection is available here. worn by John Q. A. Nadenboush, ca. 1858-1861. The collection is located at the Virginia War Museum, located at 9285 Warwick Blvd, Newport News, VA 23607 and is an easy drive from Williamsburg, Yorktown and Virginia Beach. The Virginia War Museum houses a major collection of weapons, accouterments and uniforms related to all of America’s Wars since 1776. Questions can be referred to Richard Hoffeditz or William O’Neill or by calling 757-247-8523. The collection is exhibited on a rotating basis so an appointment stating areas of interest is advisable if you wish to visit the collection.